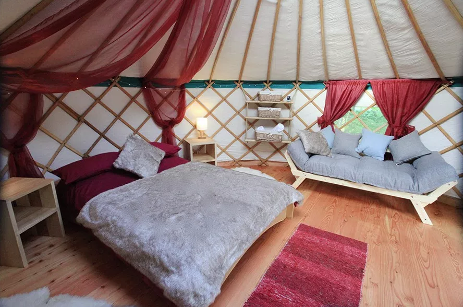 Tucked away in the heart of rural Northumberland, our Cloudhouse Glamping yurts are handcrafted by us and our team in our canvas and wood workshops offering our own unique take on the traditional Mongolian Yurt. 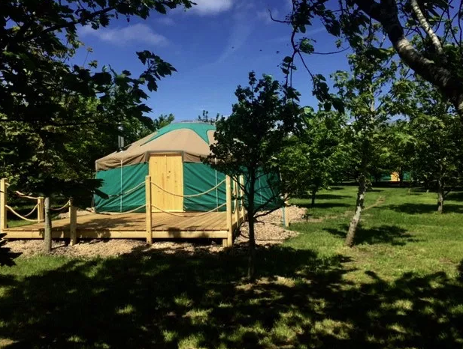 Our four yurts are situated in a small wooded glade to the central hub of the artisan farm complex, Vallum Farm. The farm itself offers a Restaurant with Chef’s Room, a lovely tea room, ice cream parlour as well as a patisserie and deli, all which use the farms own produce or locally sourced goods. Each yurt is beautifully furnished: wood and kindling for the toasty log burner with tea and coffee making facilities. Vallum Farm, host to our Glampsite is just a stones throw away from Hadrian’s wall. Ideal for the avid hiker or someone who just wants to get away from it all. The valleys surrounding the farm are truly a sight to behold.